This book examines multi-point cooperative communication technologies which are used to overcome the long-standing problem of limited transmission rate caused by the inter-point interference. It gives readers a clear picture of the technology map. 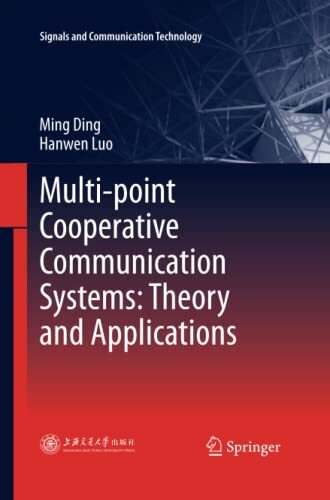 Multi-point Cooperative Communication Systems: Theory and Applications mainly discusses multi-point cooperative communication technologies which are used to overcome the long-standing problem of limited transmission rate caused by the inter-point interference. Instead of combating the interference, recent progress in both academia and industrial standardizations has evolved to adopt the philosophy of “exploiting” the interference to improve the transmission rate by cooperating among multiple points. This book addresses the multi-point cooperative communication system systematically giving the readers a clear picture of the technology map and where the discussed schemes may fit. This book includes not only the theories of the paradigm-shifting multi-point cooperative communication, but also the designs of sub-optimal cooperative communication schemes for practical systems.